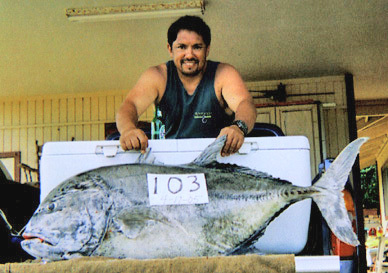 Curtney Fune scored his 103-lb "big boy" while fishing in the 2005 Waipouli Variety Jackpot Fishing Tournament. He was fishing with his brother Kevin Fune and his buddy Bobby Ferreira on the south shore and had caught two sharks before sliding a po'opa'a for bait. His new bait was hit 10 minutes later and a 30-plus-minute fight ensued before they finally gaffed Curtney's dream fish, a 100-plus-lb ulua.